I’m happy to announce that GPdotNET is feature complete. All features planned for this version are successfully implemented. 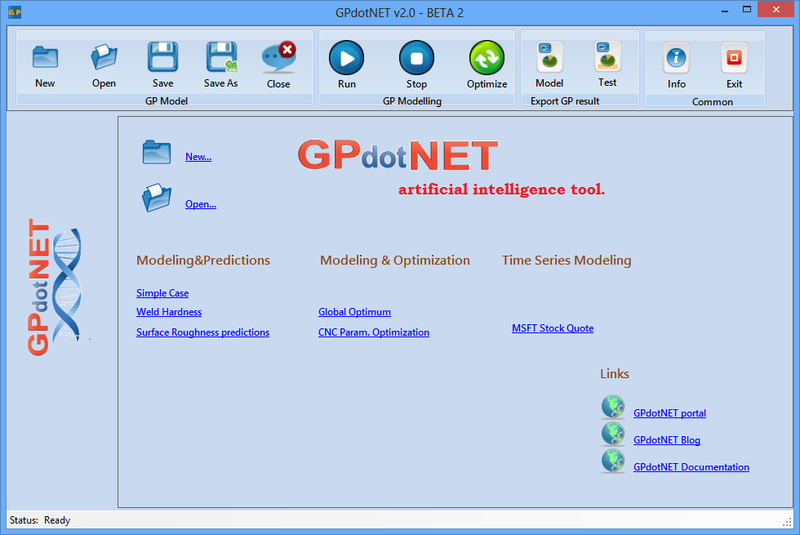 For few days GPdotNET v2.0 Beta 2, will be published at Codeplex, so you can download and taste the software. There is a brand new Start Page to show some of predefined and calculated samples. With Start page it will be easier to learn how GPdotNET works. Samples shown at the start page are some of my works, and other authors which I mentioned in the Info tab page of the model. Export feature is also implemented, so you can export Model in CSV and Excel format. Excel format is supported only on Windows. For Linux user only CSV format is supported. In the coming post it will be describe all new feature coming with this version. This entry was posted in .NET, C#, GPdotNET and tagged .NET, C#, GPdotNET by Bahrudin Hrnjica. Bookmark the permalink.